The nation was saved a national tragedy yesterday, when the helicopter the Vice President Yemi Osinbajo was travelling in crash landed in Kabba, Kogi State. There was a however a big relief when the Vice President and his delegation emerged unhurt to a frenzy of joy. Former Vice President and Presidential candidate of the PDP Alhaji Atiku Abubakar congratulated Vice President Osinbajo for surviving the mishap yesterday. In a short remark Atiku stated: â€œI just received news of the crash of your helicopter in Kabba, Kogi State. I am happy to note however that all is well with you and your delegationâ€. Caverton Helicopters, owners of crashed chopper issued a statement last night acknowledging the accident even as a stated investigations have commenced to determine the cause of the accident. According to eyewitness accounts, the vice presidentâ€™s helicopter had managed to land about 2pm at the stadium before its propeller suddenly pulled off and was flying in the air to the shock of party faithful who had gathered to welcome him. 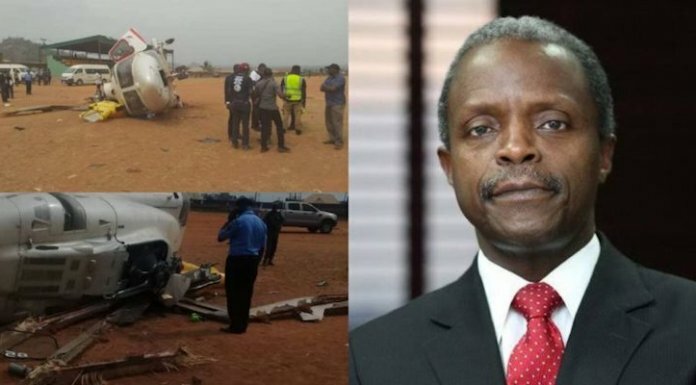 It took the effort of the security agents to rescue the vice president and other people on board the helicopter. He was taken to a waiting vehicle, which took him and other political office holders to the palace of the Obaro of Kabba for a courtesy call. Another helicopter arrived from Abuja to lift Osinbajo from Kabba to Okene and Idah, where he continued with the exercise. The main opposition Peoples Democratic Party (PDP) expressed shock over the crash. National Publicity Secretary of PDP, Mr. Kola Ologbondiyan, in a statement yesterday in Abuja called for a thorough investigation into the traumatic incident. Ologbondiyan said the safety of the countryâ€™s leaders, and, of course, all Nigerians, must be guaranteed, especially at this critical time. The party thanked God for the safety of Osinbajo, members of his entourage, and the crew. The main opposition party also urged all Nigerians, irrespective of creed, ethnicity and political affiliation, to continue to pray for Godâ€™s continued intervention in Nigeria. Deputy Senate President Ike Ekweremadu reacted via his social media handles, @iamEkweremadu, writing, â€œI received with a total sense of shock the news of the helicopter crash involving the Vice President, Prof. Yemi Osibanjo, and his entourage. Bayelsa State Governor Seriake Dickson said in a statement by his Special Adviser on Media Relations, Mr. Fidelis Soriwei, â€œI join Nigerians to thank the Almighty GOD for this great deliverance and the prevention of a tragedy that would have plunged this nation into mourning at this critical time. â€œWe should all thank God for sparing the lives of the Vice President, the other passengers and the crew for his mercies. In this country, we have a responsibility to see ourselves as brothers and sisters of a united family, irrespective of differences in party platforms. The PDP vice presidential candidate, Mr. Peter Obi, who was campaigning with the presidential candidate, Alhaji Abubakar Atiku, in Umuahia, at the time of the crash expressed gratitude to God for sparing Osinbajoâ€™s life as well as the lives of those in the chopper with him. The owners of the helicopter, Caverton Helicopters, said in a news release last night, signed by its Managing Director/Accountable Manager, Capt. Josiah CHOMS, â€œAn Augusta AW139 Helicopter, under management by Caverton Helicopters was involved in a mishap on landing in Kabba, Kogi State around 3pm today (2nd February 2019) as a result of unusual weather conditions. â€œThere were no injuries to the passengers or crew onboard and they were all quickly and safely evacuated. â€œThe relevant authorities have been duly informed and an investigation into the incident has commenced. We will, of course, support the authorities as required.